What do you guys think of this character?! She was a cute character overall. I liked her so much that I brought her into my fanfiction and called her Nike. I made her Galaxia's guardian creature and to cement their mythological relationship I gave Galaxia the royal name of Athena. She is cute but reminds me too much of Tinker Bell with her blonde hair. I am glad that they never used this character. I would like her to have some role, maybe as Sailor Moon's Power Guardian?! & while we are talking about the Power Guardians, wouldn't Tuxedo Mask have 1 as well, because, despite the fact that he isn't a Sailor Senshi, per se, he DOES have a Sailor Crystal!! My new name for this character would be Don/Danu, Mother of the Welsh/Irish Fairy Deities!! Although she isn't specifically connected to the moon, she IS strongly connected with Fairies, & even her name(s) sound similar to Diana, (especially Danu)!! That would be interesting to have her be one of the power guardians. Although I do not think the power guardians were fairies per se more or less miniature people. Although it still would be a good idea and yes I do believe that Tuxedo Kamen would have a Sailor Power Guardian since he is a Senshi. The reason I called her Nike is because in images like Athena Parthenos the Goddess Nike is portrayed as a fairy like creature. Plus I have always thought that Galaxia reminded me of Athena so I gave Galaxia the royal name of Athena and made Nike her guardian. maybe a small update in her design. I just noticed that the URL to the information about the Welsh/Irish Fairy/Faery/Faerie, (the latter 2 being alternative spelling('s), of Fairy/Plural, Fairies) Goddess, Don/Danu seems to be now a DEAD LINK, & seeing as I am no-longer able to edit the post to replace the obsolete URL directly, I've just replaced it with a working URL in the above quote!! DOUBLE-EDIT: Thankfully now, BOTH URL'S WORK!! This is the first I've heard of this character so it's interesting to still learn something new about the Sailor Moon universe even 25 years later. She's a cute design but to be honest I'm kind of glad she was cut out of the final version of the story. Sailor Moon is a fantasy of course but I feel like the series all together always strove for a magic realism tone to it. Sailor Moon just isn't the type of story to have traditional fantasy elements like dragons and elves or stuff like that, so having fairies in it I feel would require too much of suspension of disbelief for what is otherwise a grounded story. This fairy also just reminds me too much of something you would see from Winx Club or something like that. What about the Dream arc with Pegasus, the Sailor Power Guardians, and weapons that can talk/have souls? I agree that this Diana would have been out of place in the Dark Kingdom story, but she would have fit right in during the Dream arc. Actually that isn't true. Esmeraude transformed into a dragon in R and Sailor Moon is just as much a fantasy series as Winx club the series has some realism but it is every bit fantasy. 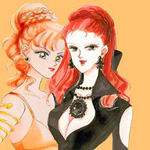 I would also add that Nehellenia did have elf ears in SuperS and Sailor Stars. Let's also not forget that the SuperS movie features fairies. Yes it's not canon to the manga (and possibly not even to the anime) but Takeuchi still designed the characters. And it can't be more outta place than that dino episode of the anime. 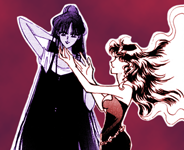 Just in-case you miss it in any/all of the above posts, here's a thread of mine dealing with a Sailor Moon Reality on Parallel/Alternative Earth('s)!! I still adore that episode and can't at all understand the hate that it gets. Maybe in the SuperS movie since as mentioned, there are fairies in that, but I just don't see where introducing the existence of a fairy race in the show would make sense. 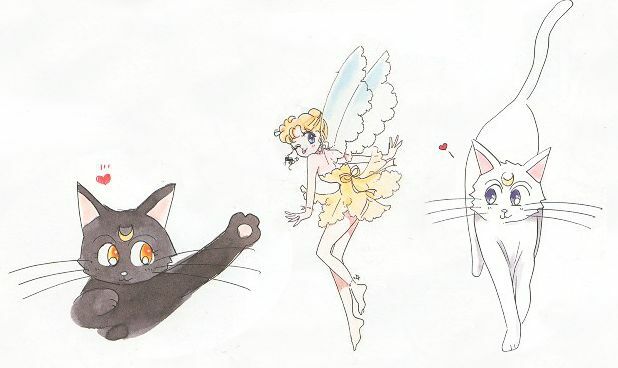 I think adding her into the SuperS season could work better but then it would make Diana the cat's existence even more pointless than she kind of already is in the 90s anime. That's more or less my view. "I reject your reality and substitute my own!" The character is certainly an interesting idea but I'm actually not sure what to think about Diana. I'm curious to see Diana anywhere, manga or anime, but her personality - what little there is - seems a bit too juvenile, which is normally fine for Sailor Moon but it might be over the top with everything else.